Sometimes is the simplest things you miss. 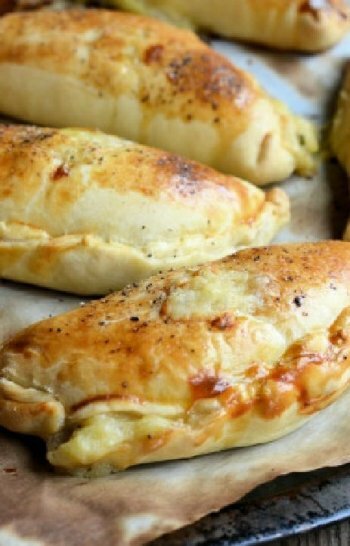 A nice hot pasty on a cold day is a real homeless treat and you don't need to be all chefy to make them! 2. Mix to a smooth paste using a fork. Add remaining mix and work together first using a fork and then by hand to bring together into a ball. 3. Knead on a work surface lightly dusted with a little more GF flour until completely smooth. Cling film and chill the pastry for 20 minutes. Knead again before rolling. Divide pastry into 6 equal pieces. 1. Preheat the oven 180C/160CFan / Gas Mark 4. 2. Dust the surface with GF flour and roll each piece into a circle approximately 14/15cm. 6. Brush the pasties with beaten egg and cook for 1 hour reducing the heat to 160C/140C Fan / Gas Mark 3 after 40 minutes. New Year's Day calls for something just a bit special. This could be just that! 1. Preheat oven to 400 degrees. Using a serrated knife, slice off top quarter of garlic, exposing as many cloves as possible. Place garlic, cut-side up, on a piece of parchment-lined foil. Drizzle with 2 tablespoons oil, wrap tightly, and roast until cloves are tender, about 40 minutes. Let stand until cool enough to handle. 2. Squeeze garlic to push out cloves; transfer to the bowl of a food processor. Add parsley, sage, vinegar, and remaining 2 tablespoons oil. Process until smooth. Season with salt and pepper. 3. 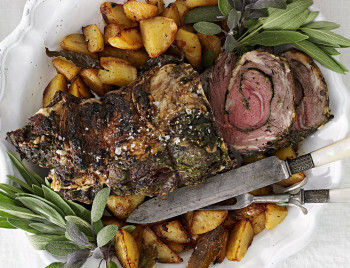 Arrange roast on a large cutting board, fat-side down, with short end toward you. Holding a long, sharp knife parallel to (and about 1 inch above) cutting board, make a shallow cut along length of roast, stopping about 1 inch from edge. Open roast to the side, and continue slicing until about 1 inch from next edge. Open to same side again, and continue slicing until roast is completely flat. Season meat all over with salt and pepper. Spread all but 2 tablespoons of garlic-herb mixture over meat. Roll meat up, starting from left side. (Fat cap should end up on top of roast.) Tie at 2-inch intervals with kitchen twine. Rub outside with remaining garlic-herb mixture. Let stand at room temperature 1 hour (or refrigerate, covered with plastic, overnight; bring to room temperature before cooking). 4. Preheat oven to 400 degrees. Place meat on a rack in a roasting pan and roast, rotating pan once, until meat is golden brown, 40 minutes. Reduce heat to 300 degrees and continue roasting until a thermometer inserted in thickest part reads 125 degrees, 50 to 60 minutes. Let rest at least 30 minutes before slicing. 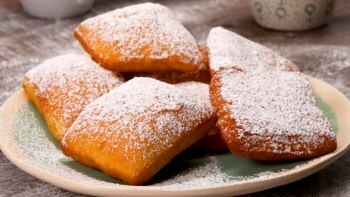 Beignets originated in France and are most probably the predecessor of our Dough Nuts. But they've done a bit of travelling and evolving over time. Around 1763 the new French settlement in the New Orleans area was founded and understandably the settlers took with them tastes of home and recipes. 200+ years is quite some time for a recipe to adapt and be adapted and The New Orleans Beignet is arguably a great deal better than it's ancestors. But you don't need to visit the Mississippi delta area to enjoy them. You can make them with ease at home right here in Yorkshire! 1 In a large bowl, dissolve yeast in warm water. Add sugar, salt, eggs, evaporated milk and blend well. Mix in 500g of the flour and beat until smooth. Add the butter or margarine, and then the remaining flour. Cover and chill for up to 24 hours. 2 Roll out dough 3mm thick. Cut into 6cm squares. Fry in 180 degrees C hot oil. If beignets do not pop up, oil is not hot enough. Drain onto kitchen paper. 3 Dust icing sugar on hot beignets. Serve warm. Fad Diets - We've all heard of The Atkins Diet, Nutra-Blitzing vegetables and fruits into a slurry and the latest fad, The Clean Diet. If the latter is a new concept to you, it's basically all of the above without the wheat, dairy or meat content. Hmmm Cabbage soup, sounds so appealing. So let's all be clear on this. These are clearly Fad Diets and are generally spawned by those wishing to sell products, gadgets or possibly books. Or idiots on the Internet who think it's fun to play with social trends. Immune Disorders – The worst of the worst and not generally understood. Again it's probably best and least biased if I use a person example. 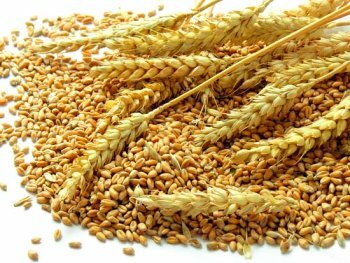 Sue my partner has Coeliac Disease. In the simplest terms this means that if she eats anything with Gluten in it, in almost indeterminable proportions she will be violently ill for days, but also cause irrevocable damage to her intestines. This is because her immune system is in some way triggered to kill the Gluten. Unfortunately this also kills cells in her gut which cannot be replaced. Ever. So what do I do? Firstly I eat the same diet as Sue. Not because I'm on a Fad Diet, but because cross contamination from my food could very well make her seriously ill. Strangely you can have a full and nutritious diets without wheat. It just takes a bit more planning. So next time you see that book. "38 deadly foods" or that Facebook post " 1000000 things to should eat - never" Think about the reasons why these people might be pushing these anti-science and unprovable ideas at you - Just a thought! So if you see me with my glasses on looking at the small print on the back of packets. It's not that I've gone all "Fad" or making up some intolerance which I simply don't have. It's because I care about my partner. Don't judge me.